The majority of our belief system is shaped during our childhoods. We experience life through the perspective of our belief system. At some point along the way, we may hit a wall and find ourselves dissatisfied with our experience of life. We might fool ourselves into believing that if we just get that new car, new wife, new purse, our experience of life will be better, and we will find something we are lacking simply by acquiring something we long for or achieving a goal. But what happens when we acquire and achieve and we still feel dissatisfied? Finding a sense of satisfaction may require gaining a new perspective of your life or yourself. And establishing a spiritual practice can facilitate the shift you looking for. A spiritual practice is an organized way of getting to know yourself on a deeper level. 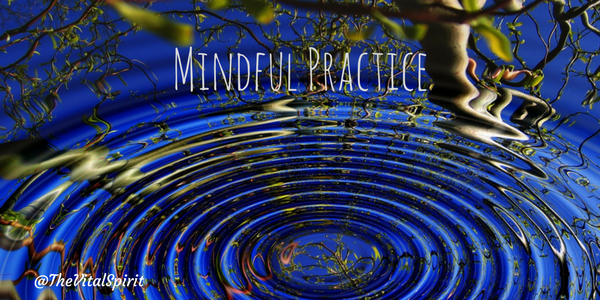 Mindful practice can involve meditation, journaling, observation of your emotions and how you respond when you have different emotions. This information when observed without judgment can teach us so much about how we can find more satisfaction in our lives. While this may seem scary to some people or foolish to others, self-reflection is how we make what is unconscious within us, conscious. Because we are primarily run by what is unconscious in us. Noticing where our belief system has programmed responses or reactions to certain stimuli and working with meditation, observation, and practice to shift those perspectives is empowering and in a very real way, life-saving. If you are interested in exploring one type of mindfulness practice specifically aimed at empaths and lightworkers check out my Tools for Thriving as an Empath class, it starts this coming Sunday at 6:30 pm.